OMAHA, Neb. (CNS) — Erin Moore hopes to move in when the St. John Paul II Newman Center opens near the University of Nebraska at Omaha in fall 2016. “It will be nice to become a community, helping each other grow,” said Moore, a junior at the state university who is already involved in campus ministry through the local MAVCatholic community and the Colorado-based Fellowship of Catholic University Students, known as FOCUS. Moore was among more than a dozen students who participated in the center’s June 30 groundbreaking, along with Omaha Archbishop George J. Lucas; Lt. Gov. Mike Foley of Nebraska; the university’s chancellor, John Christensen; and Chris Jerram, a member of the Omaha City Council. Archbishop Lucas blessed the grounds and the people involved with making a dream come to fruition — a student center for Catholic worship, study and service. He also joined the students and others in turning shovels of dirt to ceremonially begin the work of building the $22 million center. 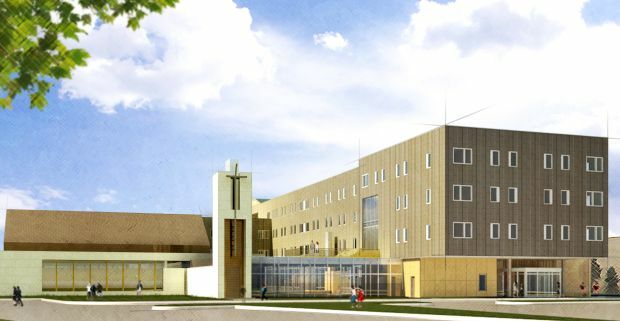 Named after the late pope, the center will encourage students to explore and develop their faith; invite a personal relationship with Christ, leading to discipleship, and a love of the sacraments; discernment of vocations to the priesthood, religious or married life;and pursuit of authentic love as the foundation for relationships, archdiocesan officials have said. Archbishop Lucas also expressed gratitude for the partnership the archdiocese has forged with officials at the University of Nebraska at Omaha — and freedoms in the United States that make possible such partnerships for the common good. “I pray to God it will always be so,” the archbishop said. Christensen said the university welcomes the new student housing, and the Newman Center’s faith-based mission as the school strives to develop the mind, body and spirit of its students. “We applaud the archdiocese for its involvement in the welfare of our students,” Christensen said. Jerram, a member of Holy Cross Parish in Omaha whose district includes the state university, said he has heard from people who want a Newman Center near campus. “This adds a new dimension and is a game-changer for students of faith at UNO,” Jerram said. Father Joseph Taphorn, recently named director of the Newman Center and chaplain of campus ministry at the university in addition to his duties as moderator of the curia, vicar for clergy and judicial vicar, said students at the groundbreaking are one sign of interest, and he has heard from parents excited about the venture as they consider colleges for their children. Interest will continue to grow, Father Taphorn said, as the center is discussed with students in Catholic high schools and religious education programs across the archdiocese. Archbishop Lucas encouraged people at the groundbreaking to talk about the center with friends, neighbors and extended family. The archdiocese wants the center to be more than a beautiful building, the archbishop said.